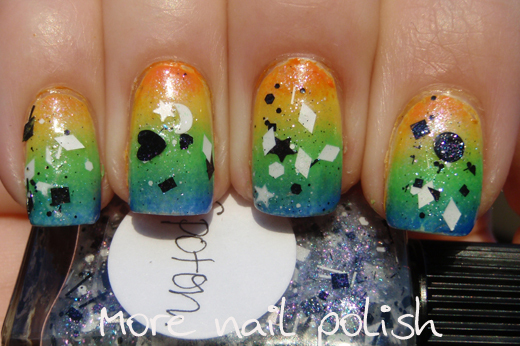 Today I had the absolute pleasure of meeting up with some other local nail polish addicts. 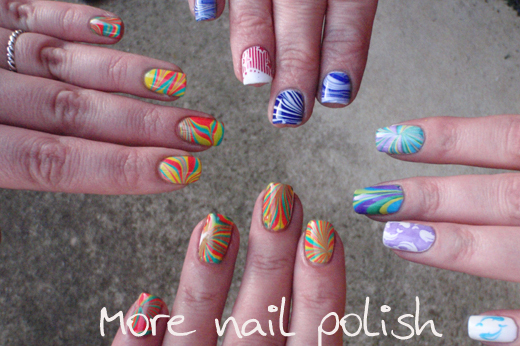 This time around we planned to do a water marbling extravaganza, where Sylvia aka @lilyandjinks instructed us on the dos and don't and helped us all through our problems. We also got a chance to play with stamping with some amazing assistance from Julia from Messy Mansion stamping plates. But that is a-whole-nother blog post on it's own - cause I have to share some of those awesome tips. 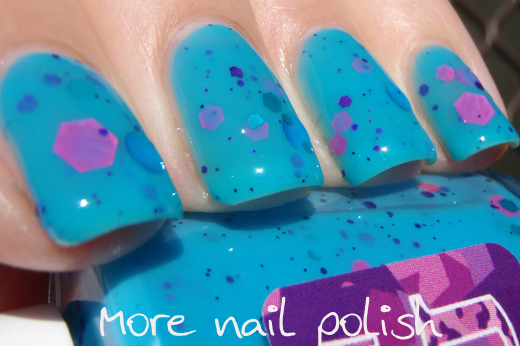 Today really was the first time I got water marbeling to work successfully directly onto my nails. I'd pretty much given up after so many failed attempts. These manis aren't great, but I'm certainly happy with them and I learned so much. 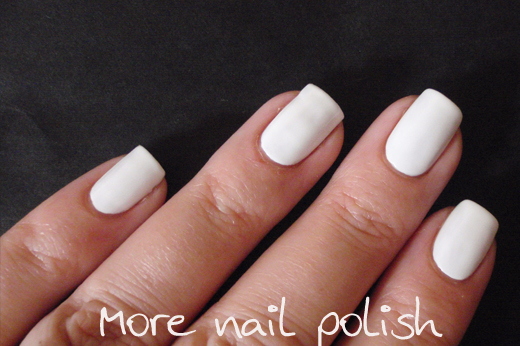 I painted my nails in Gelicious French White, so I had a set white base ready for my marbeling attempts. The gel base was fantastic, because I was able to wipe off any really nasty looking nails and not have to paint my nail white and start again. 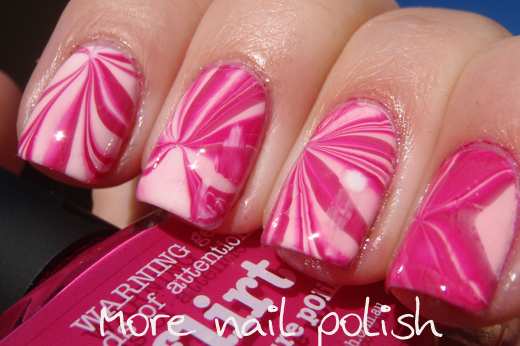 This first design I created using Picture Polish flirt, candy and fairy floss. In this next design I was learning about how to create different patterns in the water. So while it certainly don't look like a cohesive design, I learned new stuff. 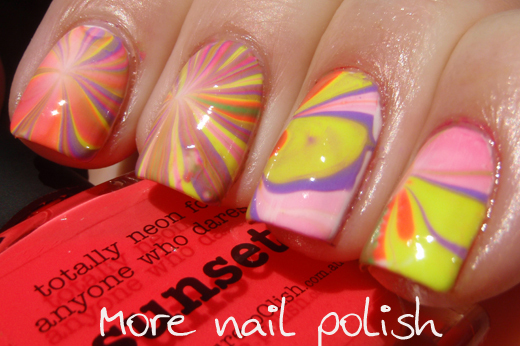 This used Picture Polish sunset, lime lite, crazy, wisteria and hotlips. 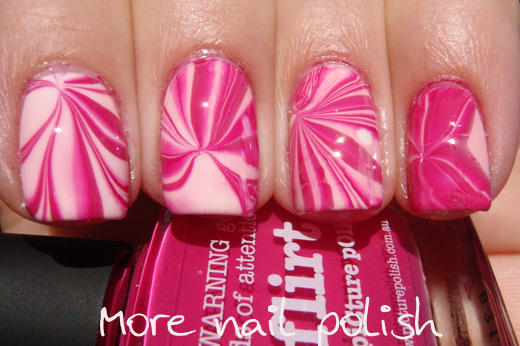 I've also got another watermarble design, but I'm going to wait a until Thursday before I show you that one. As the sun was just setting, we realised that we hadn't taken our obligatory group nail short. Everyone was ready, except me, I was back to plain white gels after practicing my stamping techniques. Bare white nails would certainly not do for a meetup photo. 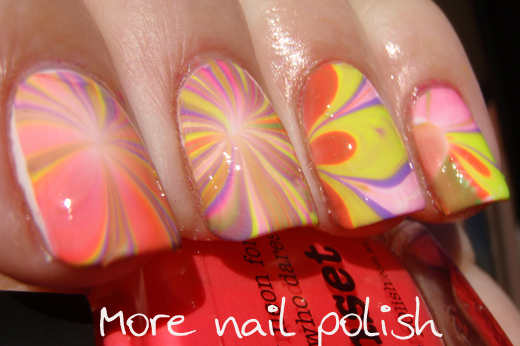 I quickly grabbed the three China Glaze polishes that Kate aka @katersnails had used in her water marble, cause her water marble looked amazing. I don't even know what three colours these are. This is a super rushed, 15 minute effort - but considering that, I'm amazed how good they look. 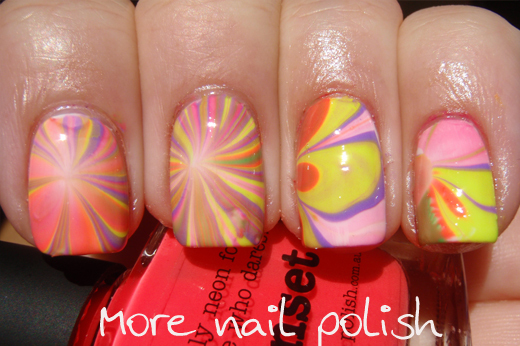 And double yay - check out our awesome watermarble efforts. 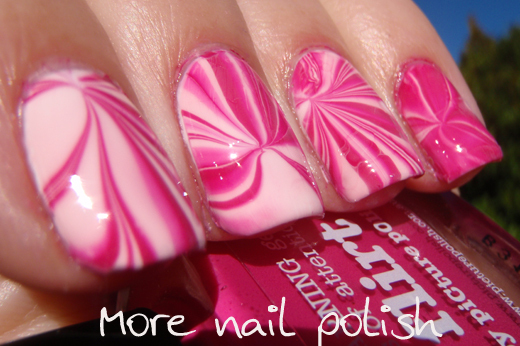 Fantastic job ladies, we were the boss of watermarbling today! I'm sure I made the most mess out of everyone, but it was a blast! Thanks so much ladies, I'm really looking forward to our next meetup already! 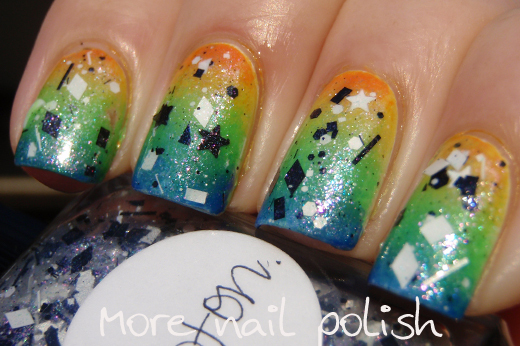 Everyone else, if you every get the opportunity to have a meet up with other nail polish addicts, DO IT! 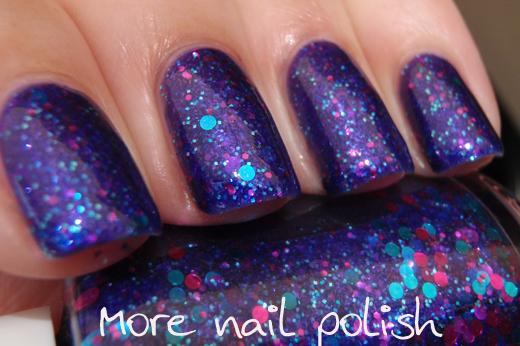 Its not very often that you can talk to people in real life about nail polish and they 'get it'. 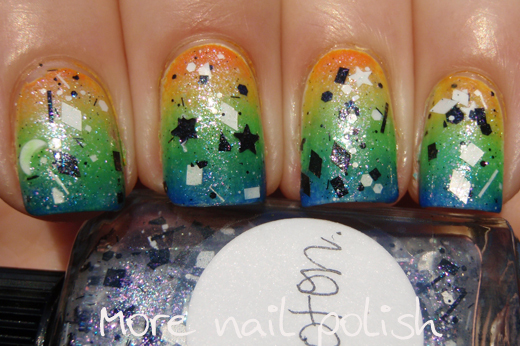 Lynnderella's Spot On, from the Mixed Feelings collection is the latest incarnation of Connect the Dots, and I absolutely adore it. It has assorted black and white glitter shapes in a multi-shimmered clear base. 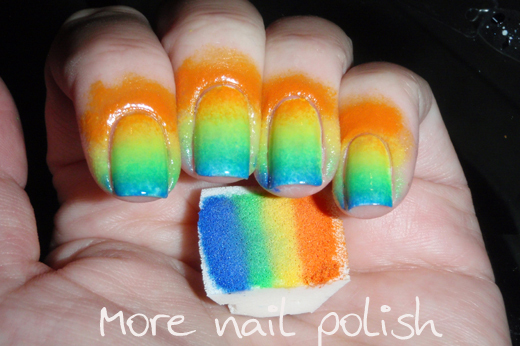 For my base I did a bright summery rainbow gradient to banish the cold winter here. I started with a white base and sponged on Picture Polish Citrus,Ulta3 Honolulu, Picture Polish lime lite and Ulta3 Blue Marlin. 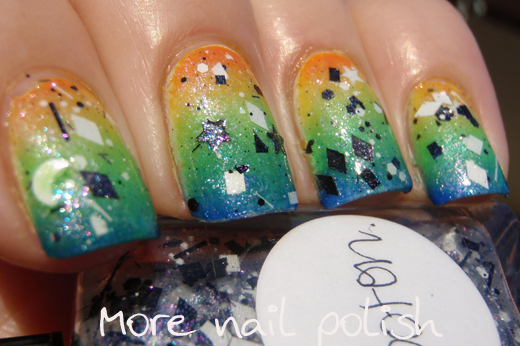 I even photographed my right hand cause I liked some of the glitter shapes on these nails. And just for funsies, here is a pre-cleanup picture of the sponging. I did a coat of PVC glue on my skin, which when the polish is dry makes clean up really easy. 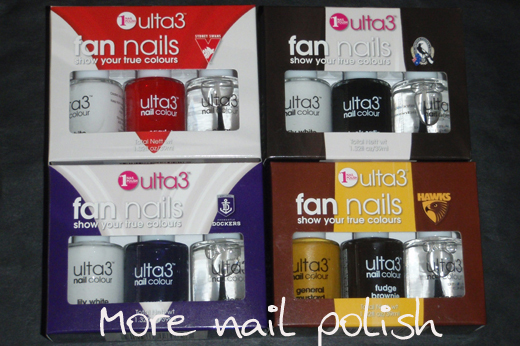 Popular Aussie polish brand Ulta3 have recently released a set of 18 boxed polishes called Fan Nails. 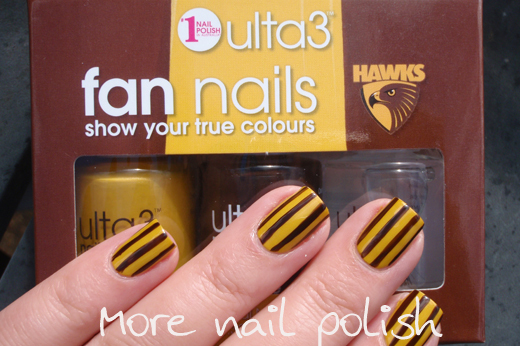 There is a set for every AFL (Australian Football League) team that contains nail polishes in official teams colours. They sent me some of the sets to review and to create some fan nail designs, so lets see how I went. 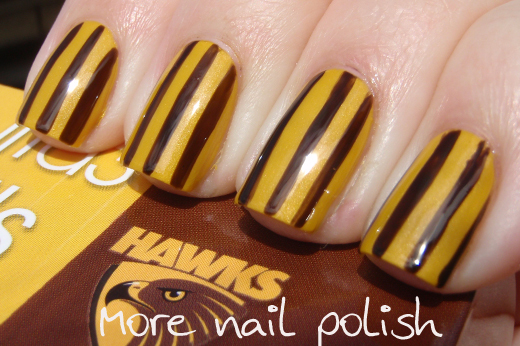 The four sets I received were Sydney Swan, Fremantle Dockers, Hawthorn Hawks and Collingwood Magpies. As you can see, each set comes with three bottles of polish. With all four that I received, there were two coloured polihses and a clear polish, basically because those teams colors only have two colours. But there are many sets that have three colours, such as the Suns, Eagles, Power, Lions, Giants, Cows, Bulldogs and Saints. Most of the sets appear to contain existing polishes, such as Lily White, Black Satin, but some of the sets definitely have new colours. Unfortunately all the promo material I've got doesn't show the polish names on any of the bottles, so while some colours look new, I cant tell. I'm going to have to check out the rest of the sets in real life to see. Each set has also comes with a Ulta3 fan nails file - which is really coarse and probably only something I would use in an emergency. 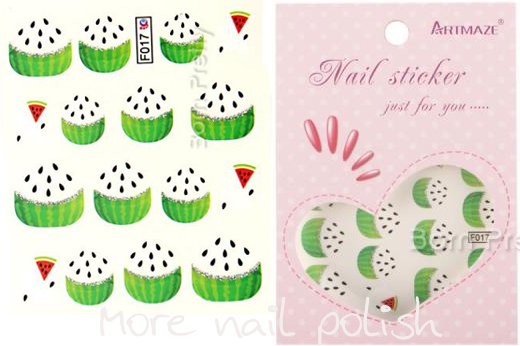 They also come with three sheets of nail sticker guides to help you in creating your fan nails. One just has straight edges, another has regular curved french guides and the third is a chevron design. The first design I created was the Sydney Swans design, and I chose to follow the promo picture and create the same design that appears on the side of the box. 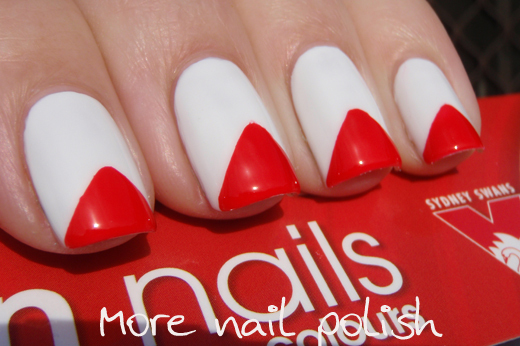 This set comes with Lily White, Scarlet, and Clear polish. I started with a white base. 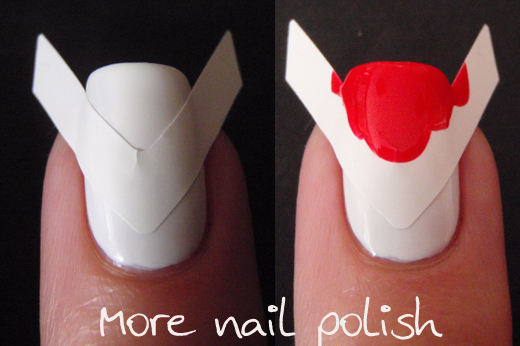 I then applied one of the chevron stickers to the tip of each nail and painted the tip in red. 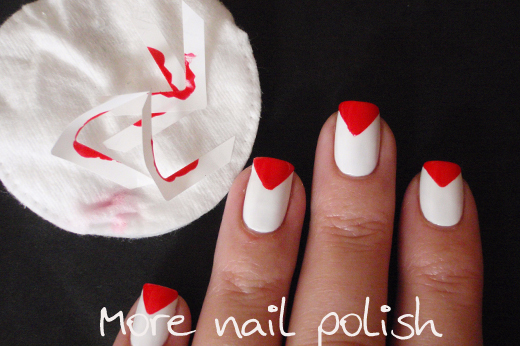 Scarlet is a super pigmented and vivid red creme, so it's just perfect for this sort of thing. After I painted each nail, I pulled the chevron sticker off. The chevron design sticker is really easy to use and you get a nice clean and neat finish. You don't get a sharp tip at the apex of the chevron using the sticker, but if you wanted it to be a sharp point you could touch it up with a fine nail art brush. Next up is the Collingwood design, and again I chose to do the simple design that is pictured on the box for this team. This set comes with Lily White, Black Satin and Clear polish. 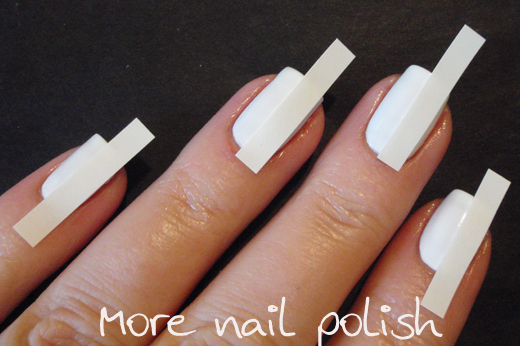 I started with a white base and when that was dry I used the straight sticker guides to tape my nail in half. I then painted one half black, peeled the stickers off and applied top coat. The next design is for the Fremantle Dockers. This set comes with Lily white, Royal and Clear. Royal is a new colour to me. 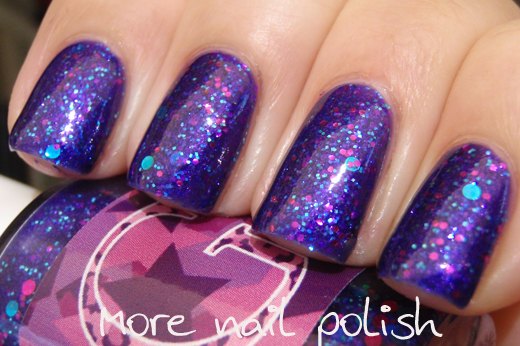 I do have a purple polish called Royal from the silver capped Speed Dry Ulta3's, but this is a different purple. It's actually a very dark purple and this first photo in full sun actually makes it look a lot lighter than it really is. 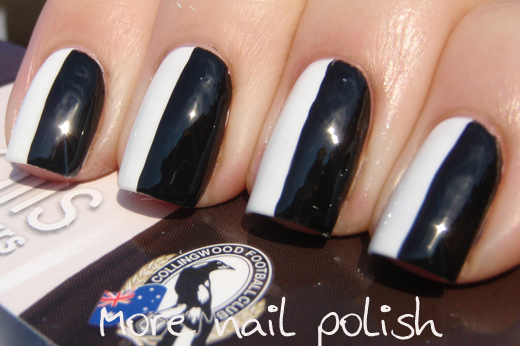 The photos with the white chevrons are more colour accurate for this polish. 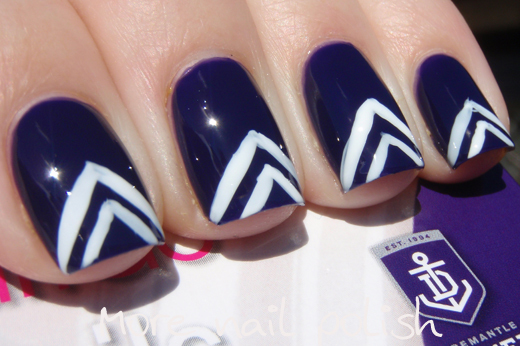 I chose to do a different team design for this mani compared to the one on the box, because the one on the box for this was the same chevron design as I already did for the Swans mani. 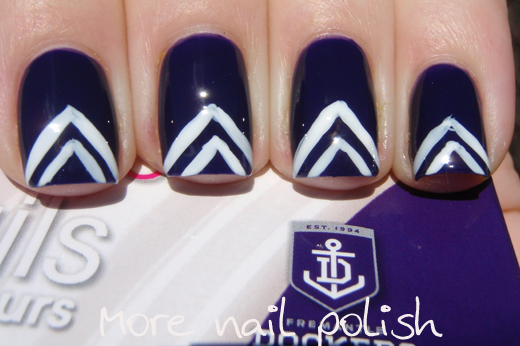 I love this purple colour, but I actually think it's a bit too dark to be the right Dockers purple colour. 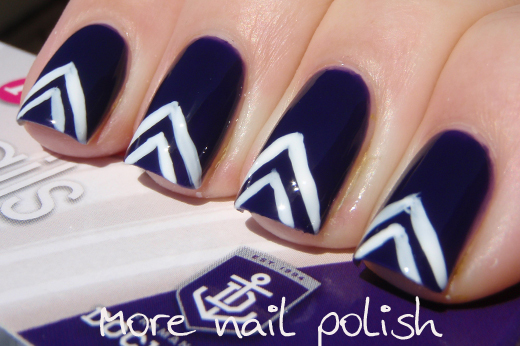 For this mani I just created a double chevron design which matches the team jersey. 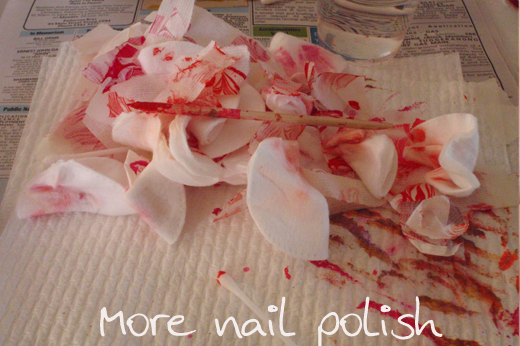 I used Lily White and a fine stripper nail art brush. 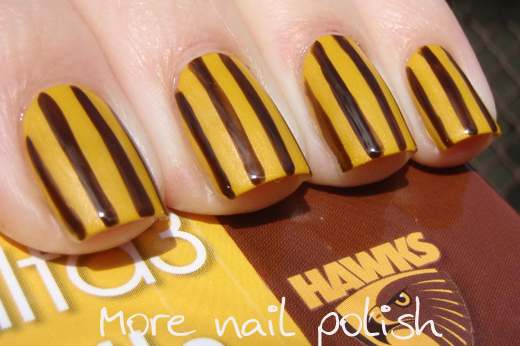 The last fan nail design I created was with the Hawks set. This set comes with two new colours, general mustard and fudge brownie. General mustard, apart from having an awesome name, is a great yellow. It has a very slight silvery shimmer to it too. I don't have photos of fudge brownie on it's own, sorry. 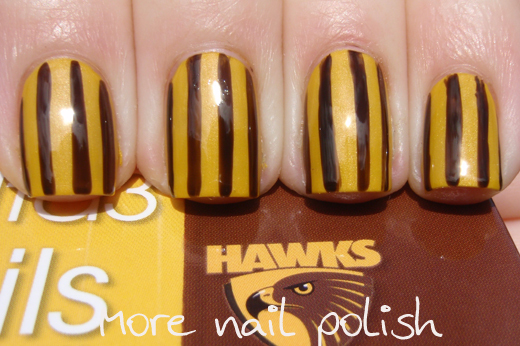 Last year I created Hawks nails for the AFL grand final, so I thought it was funny that I actually got this set to review. Back then I had to franken a yellow polish to get the right shade, so general mustard definitely filled a gap in my collection. I originally used the provided white straight sticker guides to mark off my nails, but I didn't like how thick the lines looked, so I took them off and just did thin brown lines freehand using a long bristled stripping brush. Of course I could have used scissors to cut the tape up into smaller lines, but the truth was I didn't have the patience to tape up my nails that much. In the end I was really happy how these turned out for free hand stripes. 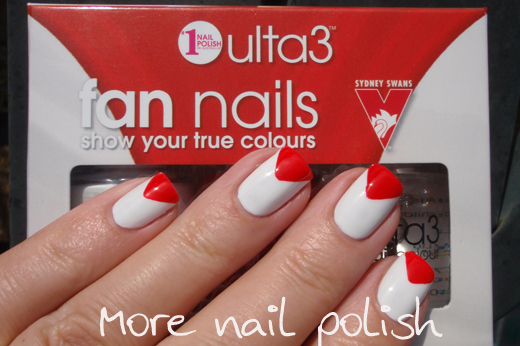 The Ulta3 AFL Fan Nail boxed sets retail for $9.95 and are available from selected pharmacies, AFL stores and Club Merchandising stores. They are also available at participating supermarkets. The Ulta3 Facebook page has a stockist locator app which can help you locate shops that stock Ulta3 polishes. Are you and AFL fan? Who you you support? I'm on a bit of a roll with reviewing products from the Born Pretty Store at the moment, but I've actually found all the products I've tried so far to be very good, which always makes reviewing products much more enjoyable. 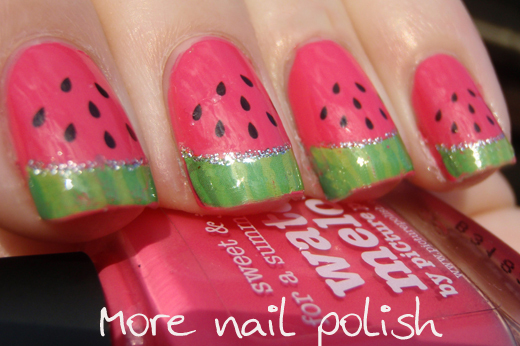 These watermelon nails looked fantastic. I particularly loved how neat the whole design was. 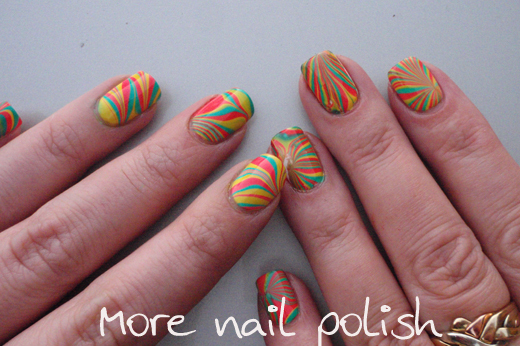 Plus, it would have to be the easiest nail art I've ever created. This design was created in just two steps. 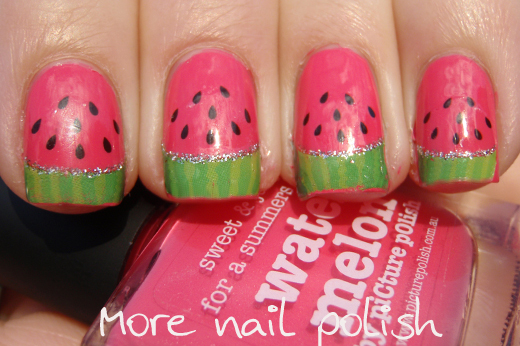 Step 1. paint your nails in watermelon pink shade - I chose Picture Polish water melon, because it's the perfect shade and name for this mani. Step 2. 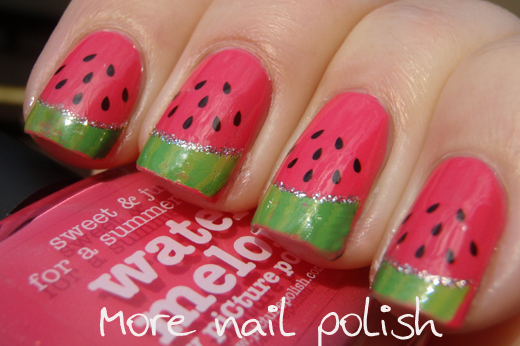 Apply the watermelon water decals to the tip of the nail and coat with top coat. These watermelon decals come complete with the two toned green tip, the perfectly shaped and positioned black seed dots and the fine silver glitter french tip line along the smile line. I did find these decals a lot thicker that other decals I have used. In fact they were quite stiff even after they were off the backing paper. 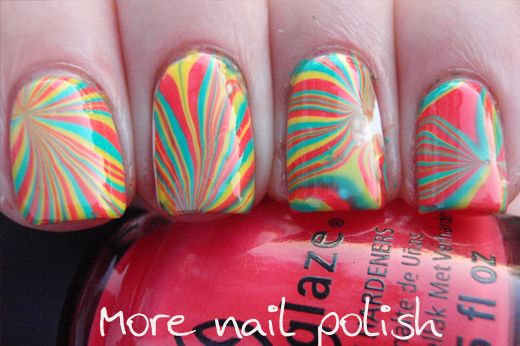 Because of that I found they wouldn't lay flat along my nail. So what I did was roll each individual decal in my fingers to pre-curl it before placing it on my nail with a bit of water. 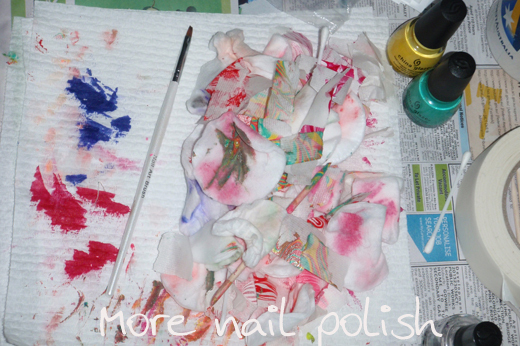 Once it was positioned in the right place I blot the nail with a tissue to remove all the moisture and then let them air dry for about 10 minutes before putting on top coat. I did get a bit of shrinkage of the decal using Seche Vite, which pulled it back from the tip of my nails a little bit as can be seen in the photos. Even though these decals are thicker and stiffer, I didn't find that the edge of the clear decal was visible on my nail anywhere after applying top coat. This is what you get in the set of decals. You could get two manis out of it if you did only four fingers on each hand. I chose to do all ten fingers in the watermelon design rather than using any of the mini designs that have a wedge of watermelon, two black seeds and the words 'water melon' printed in white (which you can't see in these photos). These decals are available here on the Born Pretty site, and my discount code is MNPG10.